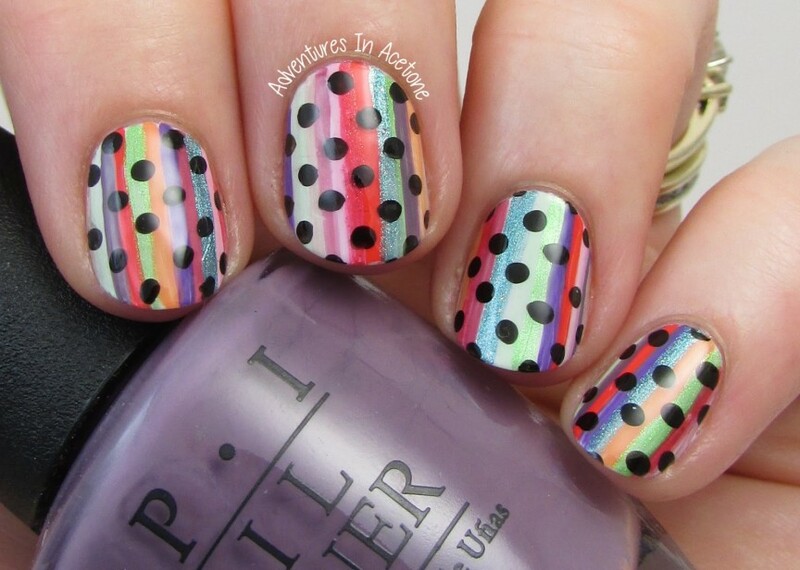 The Digit-al Dozen DOES Patterns On Patterns, Day 3: OPI Hawaii Collection Stripes + Dots! Good morning, readers! I have a colorful manicure today for Day 3 of Patterns on Patterns Week with The Digit-al Dozen! The 2 easiest patterns for nail art are stripes and polka dots–so I’ve decided to combine them! I’ve used the entire new OPI Hawaii Collection (minus the yellow glitter called Pineapples Have Peelings Too!) for the base stripes of this mani. I think it’s fun to see them all side by side, and they made a bright base for the bold polka dots. I started out with a white base coat of OPI My Boyfriend Scales Walls. Then, I took a striping brush and did random vertical lines of the OPI Hawaii Collection. Lastly, I used a born pretty stamping plate image of polka dots and stamped those on top using Sinful Colors Black on Black. KBShimmer Clearly On Top was used to seal it in and add shine. What do you think? I think it’s fun to see a collection of polishes in one mani. You can see how different and colorful the Hawaii Collection is! I should have that collection up as swatches in the next week or two so check back for that! Thanks so much for reading! What a fun way to use the entire collection! I love these colors together! I was really nonplussed by this collection though. It just seems like standard colors. This is super amazing! Beautiful colors and cool pattern combo! It's a Hawaiian rainbow! Makes me want to go on vacation there again. I love it. Another stripes and dots!!! LOVE!!! I love how the colors play off of each other. Gorgeous! This mani is so fun and colorful! These are so bright and fun! Love them! I love this style and the base colours! Whoa! The dots look like they are floating! Beautiful!